diately called Lara, an experienced nurse practitioner, who runs a clinic in the gated colony in which they both live. Her pain was not as bad as she had thought. She took the treatment advised by Lara and was walking in a few hours. The same day, Lara received a call from Tanzania, asking for advice regarding a child.People across the world are seeking a person with medical knowledge who will listen to their complaints when they or their loved ones are ailing. In most countries getting a doctor to patiently listen to ones complaints of illness is very rare. It is hard to get doctors or nurses who are willing to spent time to listen. Listening and caring are two characteristics of Lara Olson. She will diligently pursue the signs and symptoms to come to a diagnosis, which is often overlooked in a busy medical world where there seems to be no time to listen and understand the presenting signs and symptoms of patients. Gathering Together through Lara, provides an oasis where complaints are listened to and suitable treatment is provided. People from across the world call Lara for advice and a second opinion. 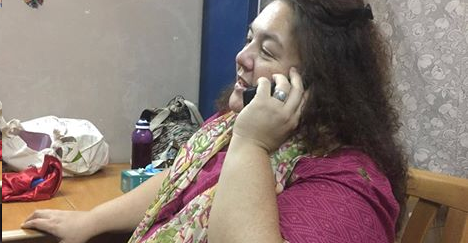 Lara keeps getting calls from NGO partners across the world related to health. She is never too busy to not have the time to listen. She ensures she gives the time required to listen and address the health issues and complaints. 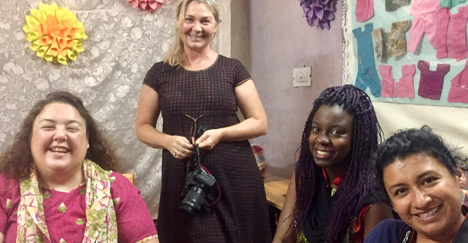 A group of 20 ladies from different countries and cultural backgrounds, who live in Bangalore, have come together to put their collective time, skills and talents to a noble cause. They have been taking photos of Bangalore—Moments caught to capture the elixir of Bangalore. This will be put together and made into a coffee table photography book. The proceeds of the profits will go to providing aid for an NGO. Lara has been involved in this project and has made a case for Deepam to receive additional funding. An Irish family enabled to be able to adopt a baby from China for the first time. Two families from Italy and Spain respectively were the first to be able to adopt children with special needs from China. First playground to be build in Liberia – at present 2 playgrounds built with 2 more to be completed before 2017. No Ebola in Liberia in the areas Gathering Together is partnering with 2 hospitals. Equipping educators with infrastructure and trainings to improve quality and increase capacity of selected schools in Philippines. Sports team in Philippines provided opportunity to upgrade their skills and now are champions in multiple tournaments. 130 babies born with congenital anomalies ranging from gastroischis (contents in abdomen cavity outside of abdomen), spina bifida (spinal cord outside body though opening in spinal column), etc provided with required surgical interventions and their adoptions facilitated in China and around the world in partnership with Baobei Foundation. 2 open wells dug in Liberia. Olson family been adopted by the village of Sackie Gbomoh.